I really like this. It says connection and support to me. Is that weird? ‘Cause it does. To me. Beautiful collection and perfect for the theme!! Wow, #4 looks really strange – so very pale. Like zombie hands. What a fun collection of hands! I played today with wedding hands! Over from tnchick – great collection. 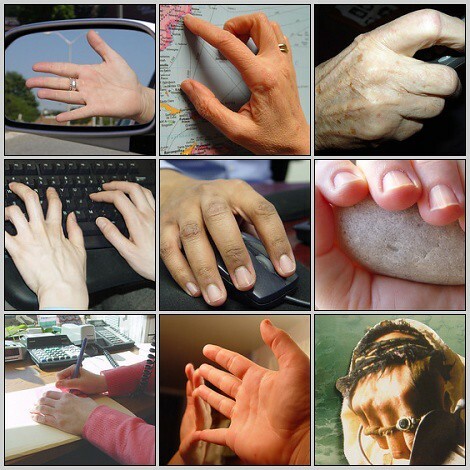 Nice collage of hands… Happy weekend! Great collection of hands for today! My Photo Hunt is up! I hope you get a chance to visit me, too. Very cool–I’m glad they were labeled–the last one had me baffled. What a great collection of hands. I particularly like the last one with all the rings. What a wonderful group of hands…. did this theme ever remind you of the Adams Family… didn’t they have a hand that wandered all over the place? ; ) Thanks for stopping by. You really hit the point – fabulous entry. … but, but … one’s missing … where’s a shot of your hand and the quote?! ?